One of the sewing machine feet that I absolutely have to have is the walking foot. Some people call this a dual fee foot or an even feed foot, but I always use the term "walking foot". What is a walking foot and why do I believe it is so important? The walking foot works with the feed dogs to move the top fabric along at the same rate as the bottom fabric. This helps to avoid a situation where the top fabric is being moved along at a quicker rate than the fabric you are sewing it to (the bottom fabric). When do I use the walking foot? I use it when I'm stitching borders to the sides of my quilt top. I also use it for quilting. I use it to stitch binding on to my quilt. See? The walking foot has lots of uses! Some walking feet come with the sewing machine when you purchase it while others are an additional cost. I strongly recommend that you purchase a walking foot if one didn't come with your machine. It is a foot that you will use over and over again. You will find marks on some walking feet that indicate the 1/4" mark or 1/2" mark. This can be very helpful when you want to stitch a 1/4" seam. It's also helpful when you want to stitch a 1/4" or a 1/2" away from a previously stitched line. 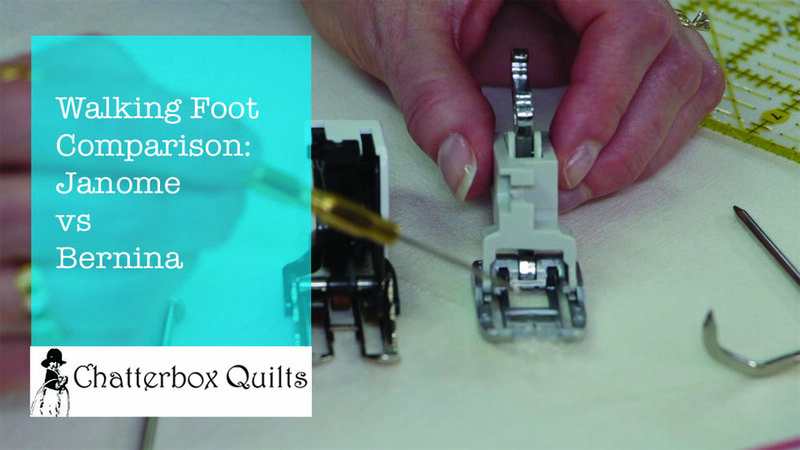 As I have both a Bernina sewing machine and a Janome one, I was able to show you the difference between their walking feet. The video below or on my YouTube channel shows you these differences. If you have a walking foot for your sewing machine, take a closer look at it. Does it have markings to indicate a 1/4" or other measurements on it? Leave me a Comment below to tell me about your sewing machine's walking foot and how you like to use it.